It’s a small, somewhat grainy picture on page nine of yesterday’s newspaper. The only person in the picture is a woman, someone author Andrew McCall Smith would describe as “traditionally built.” She wears a long red skirt and a purple tee shirt and her grey hair is pulled back into a bun. The two bulging sacks she carries could very well hold onions, carrots, cabbage and whatever else she found for tonight’s soup. Why all this descriptive verbiage? Because I need to make her real, not just a woman living 6000 miles away in the Ukraine. (That’s how far Donetsk is from Colorado Springs.) Shall we make her even more real by giving her a name so she assumes not just personage but personality, more akin to my condo neighbors or friends from church or family in California and New York? Olga walks home from the market with her supper supplies. A task many of us handle several times a week. But…and it’s a huge differentiating but…off to the woman’s left is a large white building, perhaps a government office building or a school. Near its eaves is a jagged hole quite obviously the result of weaponry. 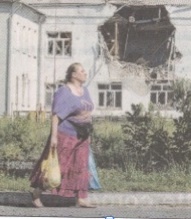 Olga doesn’t even glance at the building as she passes. Has such devastation become commonplace to her? She just plods homeward to make the soup. Life goes on. I quickly turn the page to read about Saturday night’s Rockies game or this afternoon’s predicted thunderstorms. I need not stop to think about the Olgas of the world who live in cities with bombed buildings. If I think about them, I might also forced to think about the horrors of war in the Ukraine or the still missing teenaged girls in Nigeria. Or the smudged faces of Honduran children crossing a border. Or bodies in a field in Afghanistan or Gaza. I need to turn the page. After all, life goes on. Let’s go somewhere else–to the nearby villages–so I can preach there also. Warren and Diane Willis lived that way in Mongolia, in plunging winter temperatures, when the country was barely emerging from the control of the Soviet Union, with only five known Christian believers in the entire country in 1993. Warren used rattling Russian trucks, with nonexistent springs or shock absorbers to take the JESUS® film to countryside villages where nomads traveled long miles to be introduced to the Jesus who spoke their own language. Today, through the efforts of Warren and Diane and hundreds of other passionate people who captured Jesus’ goal as their own, there is a strong, established and nationally led church in Mongolia. Zeb and Irene were another such couple. Zeb first sensed God’s call as he read a National Geographic article about the Tuareg people. After nine years in Africa, Zeb and Irene finally arrived in Niger in 1945. For another six years, until the government granted permission to go to the Tuareg, the Zabriskies trekked from village to village in the Niger desert—often by camel or donkey—working, waiting, hoping for a breakthrough in the ministry to which they felt called. Today the Tuareg people (Sunni Muslims) remain highly resistant to the gospel, but a Zeb-like missionary, following a friendly relationship of three years, was recently able to lead three of these men to Christ. I’m not a Jim, Warren, Diane, Zeb or Irene—and I suspect you’re not either—but there still are nearby “villages” to which we called to go as followers of Jesus. 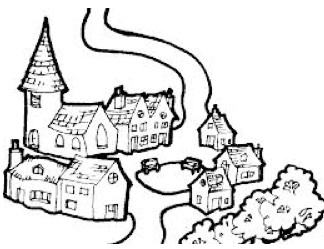 Your village may not be a spot on the map. Maybe it’s a group of people where God wants you to develop relationships. An acquaintance participates as a volunteer with the local symphony as a way to bring the aroma (and sound!) of Christ to that specific village where there are people with her own passion for music. When a couple here in town retired to a community, Kathy visited nearby condo units, inviting neighbors to a Bible discussion group. Today a thriving Bible exists in that village. One of my husband’s villages (he has several!) is the gym where he talks to staff and fellow exercisers. Or maybe your village is a skill or talent that needs to be developed, sharpened so you can be more the whole person God has created you to be. God has arranged His church in such a way that all His work can be done in all His ways by all His people gifted with all His gifts. To think about: What are your specific gifts, interests, hobbies? How can you become involved with people who enjoy similar activities? What talent do you have that you’ve dreamed about developing? “Go into all the world” is a command never rescinded. During these summer Sundays, sermons at our church are taken from the book of First Samuel. You don’t need to read far to discover the “dangers” of following God. Christians of earlier centuries—and Christians living today in what are sometimes referred to as “secure” countries (those parts of the world where the cost of following Christ is high) seem to have taken it for granted that commitment to Christ is an all-or-nothing life. Quite literally a life-or-death decision. They would not find it unusual to hear of a kind of Jacks Valley experience where emotional and spiritual “heat, rain, mud, humiliation and exhaustion” are the norm. In our well intended, and even biblically accurate, sharing of the Good News, I fear we sometimes neglect the call to arms that is inherent in following Jesus. But…and it’s really a big BUT!…if we desire to be a transformed people, those who intentionally and consistently seek to be disciples of the Savior, we will submit ourselves to the training program outlined for us in scripture and in the lives of those who’ve gone before. What does it mean to “train” ourselves to regularly practice silence and solitude? What if we were to set our minds (and perhaps our clocks!) to once an hour turn our thoughts toward God? What if we asked the Holy Spirit to highlight a word or phrase in our morning time in the Bible, then wrote it down to glance at throughout the day? What if we seriously asked God to burn into our hearts a desire a be a part of His plan to heal a hurting world? Most of the cadets who successfully complete the Jacks Valley Encampment and return to the academy will be on their way to and through the coming four years. They will occasionally fail miserably—perhaps in the classroom, perhaps in relationships—but they will have learned to trust their leaders to get them through the successful completion of the course. And what’s the connection between all this and the stories recorded in First Samuel? The glaring failure of King Saul who is the epitome of an undisciplined life and the long tale of a shepherd boy who chose the “heat, rain, mud, humiliation and exhaustion” to follow his God. Here in Colorado Springs each June a busload of young men and women arrive on the beautiful campus of the Air Force Academy. The Front Range mountains behind the campus are awe inspiring but almost all bus passengers are looking at their shoes instead of at the majestic peaks. Just moments before they said tearful goodbyes to family. (Tears flowed from parents’ eyes; in most cases these “kids” hid their own brimming eyes.) They are the cream of the crop. They have won entrance to one of the finest educational institutions in the country. Official recommendations from their government representatives were necessary for admittance. They’re on the brink of one of the greatest adventures of their lives. So why do they look as though they’re about to face a firing squad?? They have carefully read all the information about Academy training. Maybe they’ve heard personal stories from those who have formerly walked (and survived!) the path. Before even leaving the bus to step onto Academy grounds, they will be barked at by upperclassmen and women. They will be told when to speak, how to speak, where to look, where not to look. In-processing on campus includes orientation, new uniforms, assignments of all kinds. About one month after this rigorous on-campus orientation, they will be outfitted with heavy gear, march about five miles to Jacks Valley for eighteen days of what the academy website describes as “training requiring the utmost in stamina, determination and resourcefulness.” The march to Jacks Valley ends somewhere around step number 11,600 states one website. Some will not make it through the heat, rain, mud, humiliation and exhaustion, choosing to return home or to another college or university. Some of you reading thus far are ready to click off the page! Maybe you’re completely satisfied with your spiritual life. Maybe there isn’t a gnawing hunger within your soul. Maybe unanswered (or unanswerable) questions cause you to squirm. Maybe you find some of Jesus’ parables frustrating beyond degree so you just assign them an “we’ll-understand-them-by-and-by” solution. Maybe “don’t ask questions, just believe it ” completely satisfies you. But if you want to walk with me into a spiritual “Jacks Valley,” stick around for next Monday when we’ll begin the march!